Scientists at Tokyo Institute of Technology, RIKEN and Tohoku University have developed a silicone polymer chain that can self-assemble into a 3-D periodic structure. They achieved this by using their recently reported self-assembling triptycene molecules to modify the ends of the polymer chains. However, researchers nowadays consider that terminal functionalization (modifying both ends of a polymer chain) is not very effective for creating periodically ordered structures. That’s why scientists from Tokyo Institute of Technology (Tokyo Tech), led by Fumitaka Ishiwari, were interested in revisiting one of their recently developed triptycene molecules, called 1,8,13-Trip. The team had already demonstrated that this molecule can reliably self-assemble into a periodic 3-D structure made of parallel 2-D sheets separated from each other by a fixed distance (see Fig. 1). 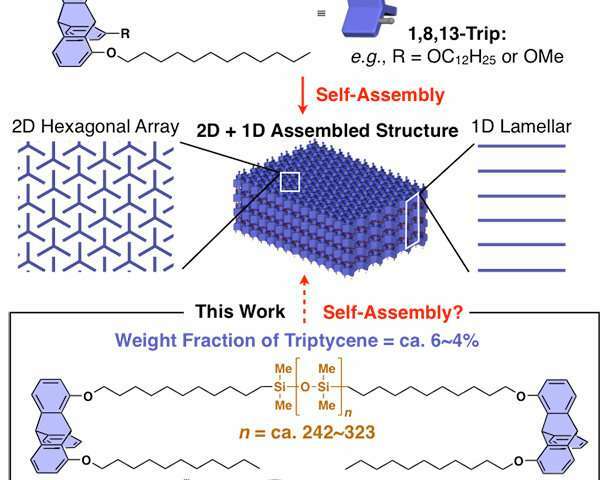 « We were interested in investigating whether the powerful self-assembling ability of this triptycene motif would also operate in polymer systems, » explains Ishiwari. Therefore, the team designed polydimethylsiloxane (PDMS) chains with the ends replaced by a triptycene molecule. They hoped that these modified silicone chains would also exhibit the promising self-assembling behavior observed for 1,8,13-Trip alone, and thus had to run many different experiments to prove it, including Synchrotron-Radiation X-ray diffraction/scattering using the BL45XU beamline at SPring-8 (Hyogo, Japan), differential scanning calorimetry and spectroscopy measurements. Fortunately, all results seemed to indicate that the modified PDMS chains had self-assembled into the 3-D periodic structure shown in Fig. 2. This was also verified by analyzing the differences in the flow characteristics of the modified PDMS chains and regular PDMS chains. The team’s findings are very promising because the triptycene motif used is simple and easy to synthesize via short steps, and may provide a powerful tool for organizing polymers and reinforcing their structural and physical properties. « The present finding will update the general notion that terminal functionalization is not effective for achieving the controlled assembly of polymers into a periodically ordered structure, » concludes Ishiwari. The team will carry on investigating the self-organization of polymers, and it is hoped that the results will lead to the development of novel materials and synthesis techniques.